Yes you might wonder why the name says corn separately and then vegetables. 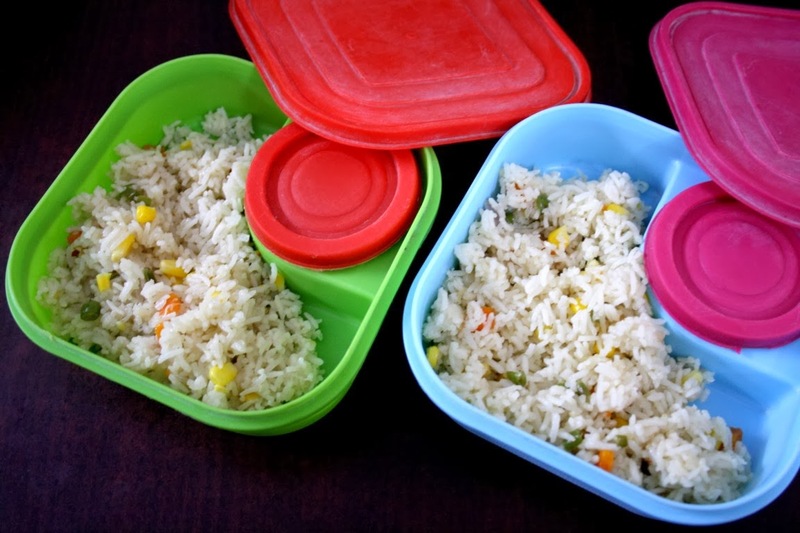 Well today’s mess free tiffin box features my boys’s box and they were particular that I add only few vegetables that they like. While Chinnu loves sweet corn, Peddu doesn’t eat. But then I can’t add it later. So I thought I would take the risk of hoping he would eat it, only to hear that he removed the corns and ate the rice. This comes after so much persuasion and cajoling them and threatening a call to their teacher. They were finally okay with carrying this, because it was promised to include only few vegetables. Anyway happy news end of the day was, this can be repeated. It’s been a long weekend and the whole day was so gloomy and dark. It rained the better part of the day and we had tough time drying the cloths. It’s such a funny thing really, we love rains, yet feel terrible because your chores don’t get done on time. Anyway we could really do with some rains. It’s been such a dry season this year. Today being Karthigai Deepam, we had all the Diyas lit and thankfully it didn’t rain in the evening. I went to Amma’s place to make the Pori Urundai. Amma makes it so well, unfortunately with all of us creating a ruckus, something went wrong and the balls wouldn’t hold shape. Whatever, we enjoyed the loose ones equally well. In a non stick pan, heat ghee, add the whole spices and saute well. After couple of minutes add onions, chilies, ginger garlic paste. Saute till the onions turn colour. Now add the corns, vegetables and simmer for 5 mins, after adding salt. This will get the vegetables cooked faster. Drain the rice and add to the pan. Mix well. Add water and cover with lid. Simmer for 10 mins, the rice is done. Konda enjoyed the meal a lot and said it turned out well. As you might have guess this was written late Sunday night. Colorful pulav.. looks fabulous, am drooling here..
looks so delicious!!! love the beautiful corn in the pulao!! colorful rice!!! same case with kuttu too, he doesn't like peas, he will pick them out of any dish unless it is not seen!!! Some how I don't like corn in any form but hubby likes it. rice looks so colorful. I like when it rains when I'm home and not when I'm out and about 🙂 I know how inconvenient it is for clothes drying in rains. 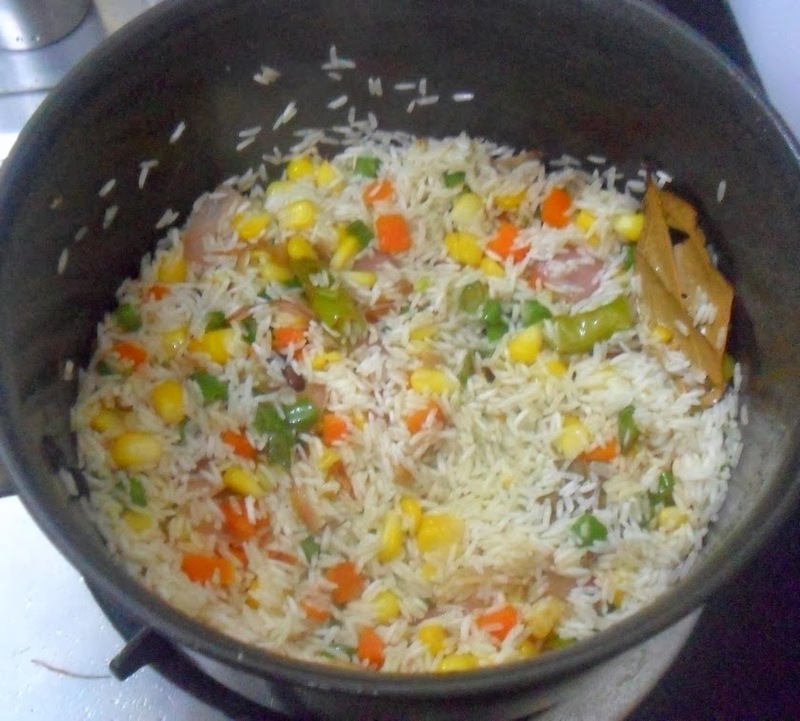 Corn pulao looks colorful and delicious. 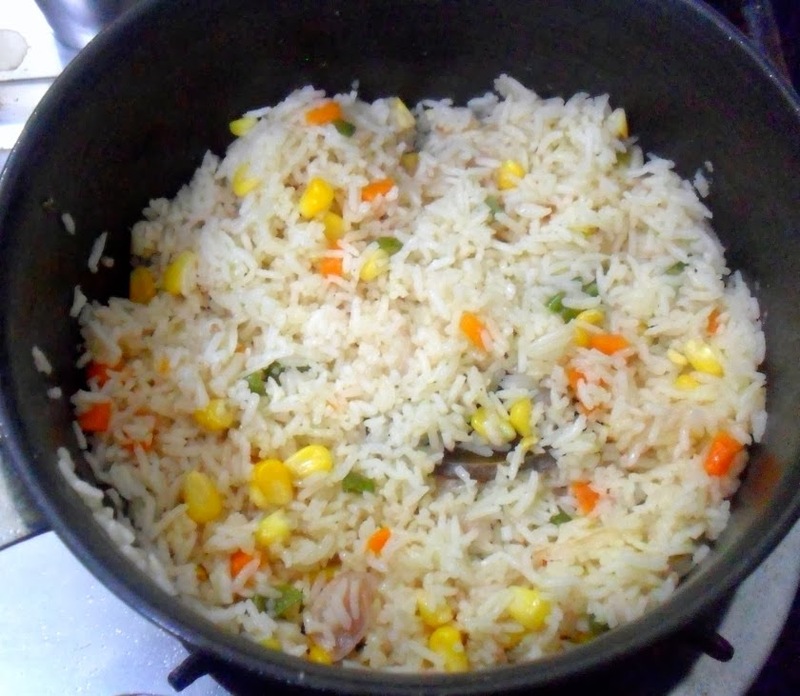 Corn Pulao looks awesome! My kids would love to eat this! Getting the kids to eat healthy food is a constant struggle all over! Very delicious one pot meal, my all time favourite..